these restaurants should certainly make it onto your bucket list! From absolutely divine to downright dangerous - dining out has ever been more exciting. The Julaymba restaurant has been dubbed as one of 'Australia's leading dining experiences', and with acclaimed chefs offering true Australian cuisine, authentic aboriginal artifacts and artworks, plus an incredible location nestled amidst the rainforest it's not hard to see why! Embracing the indigenous roots of the local Kuku Yalanji tribe, the Julaymba overlooks the peaceful fresh water lagoon providing the perfect touch to a romantic getaway. 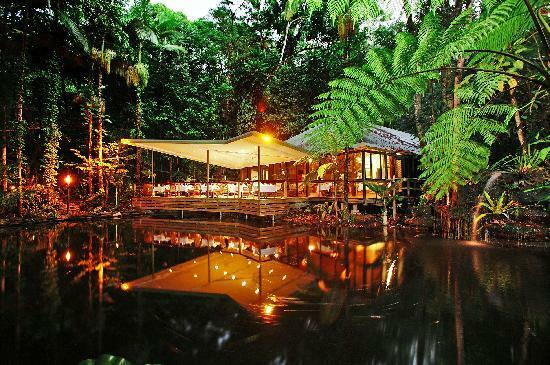 The restaurant itself is actually part of the Daintree Eco Lodge and Spa, so if you have some spare time on your hands why not go all out and treat yourself to an authentic luxury body wrap or massage whilst immersing yourself in the awe inspiring tranquil surroundings. For a truly unforgettable experience, Ithaa the world's first all glass undersea restaurant situated in the tropical Maldives is an absolute must! Venture 16 feet below sea level to indulge in the delicious contemporary European dishes, as well as the 270 degree panoramic views of the magnificent crystal clear waters and eclectic reef and marine life. This impressive acrylic shell structure, known to the Maldivians as 'Mother of Pearl' takes eating out to a whole new level. If you fancy wetting your appetite at this underwater restaurant be sure to book well in advance! Solo Per Due, or 'Only for Two' is literally the smallest restaurant in the world! With a maximum capacity of two people, no queues, and certainly now waiting around, all attention is completely devoted to you. World famous for its uniqueness and charm, Solo Per Due is an unmissable experience if you're planning a trip to Italy. Summon the waiter to pander to your every need with a silver bell and enjoy the exquisite fresh produce of the Vacone; from wild fruits to homemade pasta. Relax in the shade of the vines whilst gazing out on the enchanting valley view’s during summer, or snuggle up in front of a roaring log fire on the cold winter evenings; this historic picturesque villa is a treat all year round. Apparently the future of food looks a little something like ‘s Baggers restaurant in Nuremburg Germany. Whether the owner was aiming for state of the art, or had just had enough of going through the grueling process of hiring and firing, ‘s Baggers was born – and there is not a waiter or waitress in sight! All orders are placed via touchscreen making for a rather remarkable interactive dining experience, but if you thought that was snazzy then ‘you ain’t seen nothing yet’! 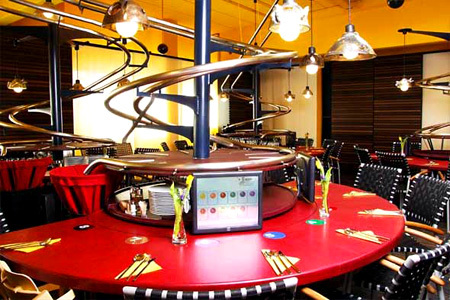 It’s not till your food arrives by the force of gravity – transported via metal tracks from above - that you’ll be truly amazed. Popular in all the major cities throughout the world, including Paris, Berlin, and Vienna, the latest innovative dining trend, ‘Dining in the Dark’ has now hit the US. Opaque is a true feast for the senses – imagine abandoning your vision for an hour or two in exchange for an exhilarating multi-sensual dining experience that indulges your sense of smell, taste, touch, and sound. When we say dark, we mean dark! Upon arrival you will be guided to a pitch black dining room, after choosing from a specifically prepared menu designed by an acclaimed local chef. It is certainly not just a meal that you’re in for here! From dinner in the dark to dinner in the sky, it doesn’t get much more daring than gorging yourself on gourmet 5 star cuisine whilst suspended 50 meters above ground! If you’re after a meal with a view then this adventurous experience at Dubai’s Habtoor Grand Resort and Spa will definitely not fall short of your expectations. As the first 5 start hotel in the world to offer the famous Dinner in the Sky restaurant, the Habtoor Grand prides itself on the stunning aerial views and unique atmosphere that their diners can enjoy. Whether trying to impress your latest date or wishing to secure that once in a lifetime deal with a business associate, ‘Dinner in the Sky’ is sure to leave a lasting impression! Combing sensational cuisine, enthralling performance art, and an upscale nightclub scene all hosted in a playful public boudoir of epic proportions, the San Francisco Supperclub is an experience that is anything but standard. Laze about on giant comfy beds whilst teasing your tastebuds with artfully plated food and beverages. For interactive entertainment and fantastic atmosphere, the Supperclub is cutting edge. With an array of global influence and inspiration, the shows range from weird to wonderful and about everything imaginable in between!